The first post I am going to tackle was written on March 24, 2006 and is about the right to health care. The thing my 2006 self didn’t consider is that there are different kinds of rights. There are the kind of rights I talked about there, and then there are human rights. Those are the kinds of things that we take for granted in the industrialized world, and we often try to provide to underdeveloped nations. Things like access to clean drinking water and, yes, even health care. As a libertarian, I had a very narrow definition of what constitutes a right, mainly, we have the right to do whatever we want and keep our own stuff, and the government should only protect us from people infringing on those rights. But that’s not the only definition of rights. Then my argument got even worse. I went on to tell a story about my then-husband working two jobs so we could afford snow tires and that maybe we need universal car repairs, because a vehicle is a necessity to get to work. When I read this recently, I was ashamed that I ever wrote this. It seems bafflingly stupid to equate health care with car repairs. One is essential to life, while one is a convenience. I’ve been without a car for 10 of the last 12 months and lived to tell about it. People without health insurance often aren’t as fortunate. When I disagreed with the idea that health care is a right, it was not because I was a jerk who wanted people to be sick and die, but because I didn’t realize that there were so many barriers to access. When I got out of college, already a single mom of two at age 22, my first job had excellent health insurance that covered me and my kids and was affordable. So did my second job. I figured, if I could find a decent job with health insurance, anyone could. I thought people who weren’t happy with the insurance offered though their employer could just find another job, a common conservative argument. I didn’t realize that, even though I was a young single mom, I still had advantages that not everyone has, like a college education and a fair amount of intelligence and aptitude to get a good job. I also entered the work force during a good economy. I’m also white. I also wasn’t living in a poor area where opportunity is scarce. There is no shortage of people being denied the health care they need. It is a myth that doctors do not turn away patients who don’t have insurance. Here’s what’s simple. We have to decide what kind of people we want to be. Do we want to be the kind of people who let the sick go untreated or even die because we don’t want to have to pay more taxes? Or do we want to be the kind of people who are compassionate and work toward guaranteeing that every person in our country has access to basic health care services, regardless of their circumstances and ability to pay? Government isn’t some bogeyman coming to steal our freedom. It is a tool that we can use to ensure that basic human rights are not just available to those who can afford it. I have prolonged this already for far too long, so I am just going to jump right in. This is my official “good bye.” For real this time. As I already told you way back in June, I am no longer going to be known in the internet world as She’s Right. In the first post on my new blog, which is called Shatter Nicely, in case you missed the last two times I mentioned that, I put it this way. I just can’t go on being She’s Right. Maybe it is that I am getting older, starting to realize that I am not always “right.” Maybe it is the toxic political environment that makes me want to eschew the right/left dichotomy. Whatever it is, I am done with it. It’s no longer who I want to be. I just want to tell you all how much this blog has meant to me. Not the blog, but you all. I have made some real friends here. I am not going to name names because I don’t want to forget anyone, but if we have ever had e-mail communications, if I ever gave you something I made for your newborn daughter, if you ever drove up to meet me for coffee and help me through a personal crisis, if you ever gave me your phone number in case I needed someone to talk to, if we ever had a beer together, if we have ever met in real life and hugged, or even if we didn’t, just know that I consider you a friend and I consider myself very fortunate to have to have met you. People say that the internet is having a negative impact on friendships, that people are not forming meaningful relationships because they are, instead, spending time online social networking. I could not disagree more. I would not know any of you were it not for the internet and this blog. I love you all and you made running this blog a wonderful experience. So, enough with all the mushy stuff. If you are even remotely included in the above list, you are totally going to read my new blog. With that, She’s Right says, Good bye. Since I am no longer going to be your go to site for conservative political opinions, I figured I would share with you some of my favorite conservative sites. I recently purged most of the political blogs I was following from my Google reader because my sanity necessitated it. But, I still have a few must-reads, so here they are. My number one site, the one that I would read if I could only read one blog, is Althouse. If you aren’t familiar with Ann Althouse, she is a law prof from Wisconsin. (Yeah, the one who married one of her commenters.) She is conservative, but she voted for Obama. I like her blog because it is an interesting round-up of what the internet has to offer and I love her conversational tone and seemingly incidental humor. The best Vermont conservative blog is, of course, Vermont Tiger. The best national blog for discussion of issues is Q and O. Q and O is a libertarian blog that tends to be more policy-oriented and less gotcha partisan garbage. A big thumbs-up on that. The best place to find out what is hot in conservative opinion is Ace of Spades HQ. If you can get past the foul-mouths and the locker room-style humor, it really is a comprehensive look at what conservatives are talking about. And Ace has some first-rate commentary when he’s on a roll. Finally, if politics has you ready to just bang your head against the wall, laugh along with the right-wing humor blog, IMAO. Bear in mind, you will probably only laugh if you are conservative, and only then if you have a certain sense of humor. So, that’s my informal list of She’s Right blog awards. Don’t forget to check out my new blog, Shatter Nicely. The moment you have all been waiting for … drumroll, please … here is the link to my new blog home, Shatter Nicely. It is not primarily a political blog, but I just did my first political post about none other than Sarah Palin. I have two more posts to do here before I officially sign off (which, I guess will be a third post), which will be done this week, come hell or high water. Thanks for bearing with my total and absolute flakiness. I re-opened the comments on the Losing My Religion post. I promoted the post a little, so I wanted to let people comment on it. You know, if someone wants to tell me that I wasn’t a “real” Christian, congratulate me on finding reality, or just tell me to stop being such an attention whore. Whatever. All comments welcome. And, since I just looked this up to make sure I was doing it right (yes, I am that neurotic), I thought I would share this will you. It’s part of my new value-add approach to blogging. A general rule of thumb is to always capitalize the first unit and capitalize the second unit if it’s a noun or adjective or if it has equal balance with the first unit. The second unit should be in lower case if it’s a participle modifying the first unit or if both units constitute a single word. Speaking of blogging, what on earth am I still doing here, you may be wondering. Yes, I am being a total flake. I am sorry. Life happens. As you have read, I have been going through a lot of changes and just haven’t been able to focus on wrapping up She’s Right the way I wanted to. I have not changed my mind about ending She’s Right for good, though, and my new blog is almost ready for the big reveal. I still can’t believe that we are having 20th anniversaries of world events that I remember happening. 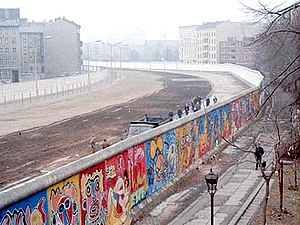 The picture on the Berlin Wall wikipedia page shows the stark contrast between East Berlin and West Berlin. I thought this was a very powerful line, from a WSJ piece, Why the Berlin Wall Fell. Barbed wire, closed military zones and the machinery of communist propaganda could keep the prosperity of the West out of sight of most people living east of the Iron Curtain. But that wasn’t true for the people of East Berlin, many of whom merely had to look out their windows to understand how empty and cynical were the promises of socialism compared to the reality of a free-market system. Though, I’m sure many of you would disagree with that emphasized part. I thought this was interesting, from another WSJ piece about Ronald Reagan’s “Tear Down This Wall” speech in 1987. Ronald Reagan would embarrass himself and the country by asking Mikhail Gorbachev to tear down the Berlin Wall, which was going to be there for decades. So the National Security Council (NSC) staff and State Department had argued for many weeks to get Reagan’s now famous line removed from his June 12, 1987, Berlin speech. With a fervor and relentlessness I hadn’t seen over the prior seven years even during disputes about “the ash-heap of history” or “evil empire,” they kept up the pressure until the morning Reagan spoke the line. If you are a long time reader of this blog, especially if you were a reader back when I was on blogger, you know that JD Ryan, the atheist blogger of Five Before Chaos, and I have a history of heated debates about all things religious. So, you might find it interesting that he and I got together for coffee a couple weeks ago to discuss religion. Not just religion, but my religion. Or, I should say, we got together to discuss the fact that I no longer consider myself a Christian, but an agnostic. I still have a lot of things to sort out. I am by no means an atheist. I am in a state of just not knowing what to think about the existence (or nonexistence) of god. All I do know is that for the past four years, I gave my power over to god based on a theology that I no longer believe is true. Now, I have taken back control and things have never been better. How this came about is really a long story, the details of which even I am not entirely certain. Suffice it to say that the questions, the doubts, the contradictions, and the logical inconsistencies just piled up to the point that I could no longer ignore them. Then one day, I just asked myself, How would my life be different if God wasn’t real? The answer surprised me. I felt optimistic for the first time in a long time. I felt like I was in control of my life and I had the power to make it better. I felt great. The one thing that scared me more than anything was the thought of telling my husband that I wasn’t a Christian anymore. In fact, I didn’t want to tell anyone because that would make it real and that was a real threat to my marriage. Not that I thought we would get divorced over it, although that does happen, but that it would upset my otherwise amazing relationship with my husband. So, I did what any one would do in that situation. I e-mailed an antagonistic atheist that likes to harass me on the internet. We got together for coffee and I was finally able to tell someone what I had been going though. He was very supportive and gave me some ideas about how to talk to my husband about it. That night I did tell Bob. He kind of freaked out for the first couple of days, but now things are going very well. He says that I am happier than he has seen me in a long time and that things at home, in general, seem much more peaceful. I have been going back and forth about whether or not I wanted to post this, but in the end I felt like it was the right thing to do. I was a Christian for the life of this blog and I was very open about that. It seemed somehow disingenuous to withhold this information. To answer the obvious question, no, my political views have not changed. I was a small-government conservative long before I became a Christian and will continue to be, barring any unforeseen head injuries. If you have any other questions, feel free to pose them in the comments section, or drop me an e-mail.